Within every Colorado school district, you’ll find the secret ingredient to healthy food access for students – the Food & Nutrition Service Department. That’s why we partner with the food service professionals of FNS Departments across the state to fill student lunch trays with fresh produce and tasty entrées free of preservatives, artificial dyes and chemicals. The success stories below represent the “drum beat” of a movement that is changing the way our children eat and ultimately live. 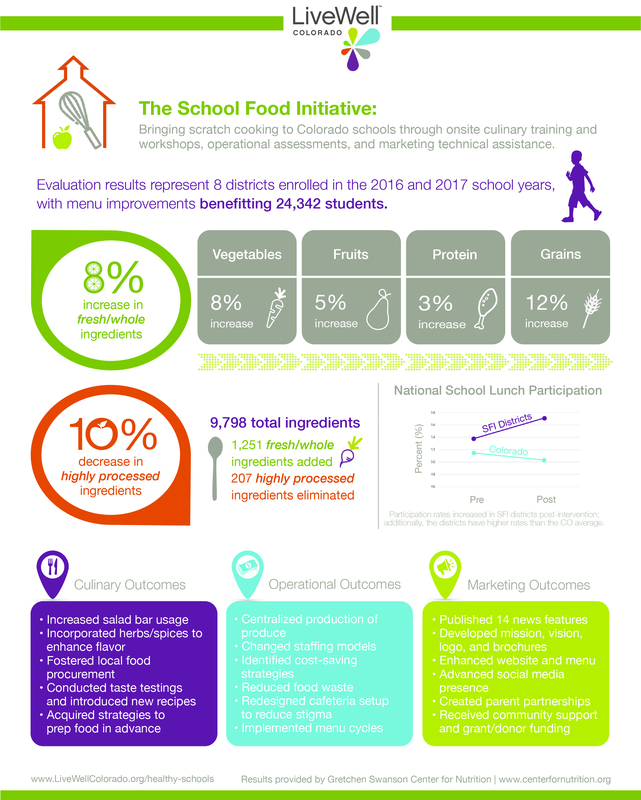 LiveWell Colorado’s School Food Initiative recently wrapped up with their latest cohort composed of eight Colorado school districts during the 2016/17 and 2017/18 school years. Activities included measuring the use of fresh/whole, transitional/clean label, and highly processed ingredients across a 4-6 week menu cycle using the Quantitative Menu Analysis (QMA) technique. A total of 9,798 total ingredients were scored during this process, with menu improvements benefitting 24,342 students. Key outcomes include an 8% increase in use of fresh/whole ingredients and a 10% decrease in use of highly processed ingredients. LiveWell Colorado would like to acknowledge the hard work of the outstanding Food & Nutrition Service staff in this cohort!